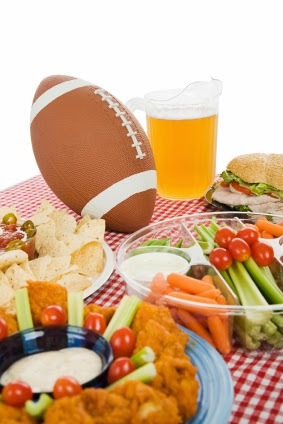 The Super Bowl is approaching quickly, so it’s time to get started planning your party! You’ll need to consider invitations, food, drinks, desserts and decorations so you can throw the Super Bowl party your friends talk about all year long. If you haven’t gotten your invites out yet, it’s definitely time to send them! A digital invitiation will allow you to save some trees while making cute invitations for free. An online invite will also make it super simple for your guests to let you know they’re coming. We love Evite’s football invitations for a cute take on a Super Bowl party invite. It’s vital to have all of the football party staples for this important game. Chips and dip and wings are pretty much required for a Super Bowl party, so make sure you plan ahead. This year, miniature foods are a big trend for parties, so plan foods that are bite size. Bite-sized pizza, burgers and even pickle chips are sure to delight your guests. Get a little inspiration for bite-sized party food from Buzzfeed’s list. Your selection of drinks will probably vary depending on whose attending your party, but it’s a good idea to have a variety of drinks to suit anyone’s tastes. Tea, juice, soda and beer is a great place to start customizing your Super Bowl drink menu. Even after your guests have eaten all of the wings and bite-sized snacks they want, they’ll still have room for dessert. Dessert is the perfect place to really let your creativity shine, too. Wow your guests with homemade football shaped chocolates using our Football Mold, make helmet shaped cookies using this cookie cutter, create a football helmet cake with this baking form or just integrate the team’s colors into the icings and batters you use to create your desserts. Adding a few fun, football-themed decorations can really pull your party together. Think about adding a couple of decorations with team colors, spreading a little football confetti around your house or hanging up a football banner in your living room. We hope you have a fantastic Super Bowl party this year! Let us know what fun things you have planned in the comments.